As stormwater flows over driveways, lawns, and sidewalks, it picks up debris, chemicals, dirt, and other pollutants. Stormwater can flow into a storm sewer system or directly to a lake, stream, river, wetland, or coastal water. Anything that enters a storm sewer system is discharged untreated into the waterbodies we use for swimming, fishing, and providing drinking water. 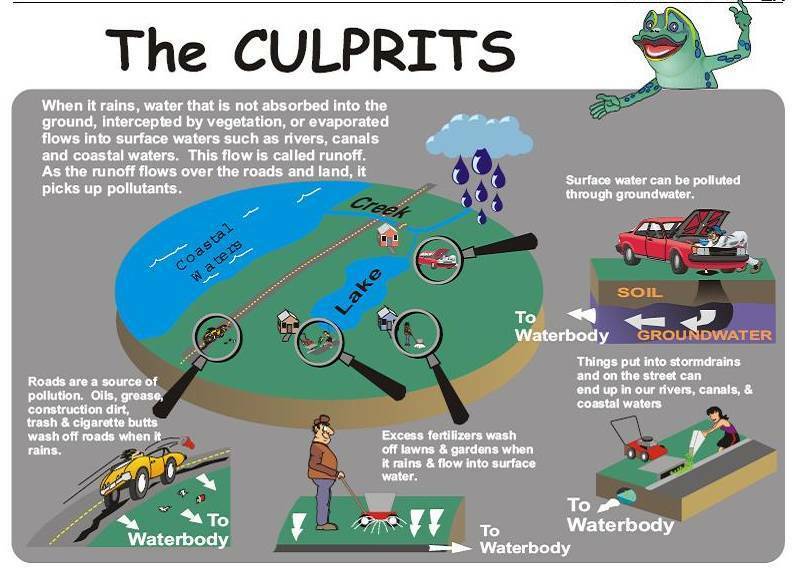 Polluted runoff is the nation's greatest threat to clean water. Check your car, boat, motorcycle, and other machinery and equipment for leaks and spills. Make repairs as soon as possible. Clean up spilled fluids with an absorbent material like kitty litter or sand, and don't rinse the spills into a nearby storm drain. Remember to properly dispose of the absorbent material.